If you use WhatsApp a lot, you may be in need of a way to back up some important messages and attachments you receive to avoid disaster when you lose them. Losing or mistakenly deleting your WhatsApp messages and attachments does happen a lot. Thus, you need extract the important WhatsApp data from iPhone and save them on your computer to create a backup for future use. 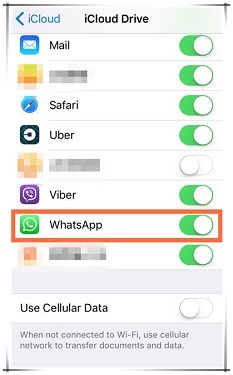 In this article, we are going to introduce 3 ways by which you can save the WhatsApp voice messages on your iPhone to have a backup in case you lose them. A short digression: If you are going to upgrade your iOS device to iOS 12/11, do remember to back up your WhatsApp data to avoid any data loss! Follow these simple steps to save the WhatsApp voice messages to an iCloud/iTunes backup file so you can then restore them if needed. Step 1: Open the Settings app on your iPhone and then tap on "iCloud". 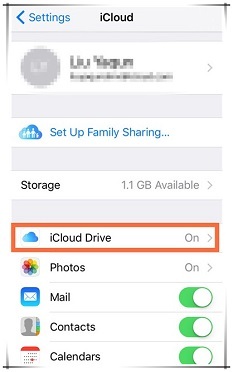 From there, tap on the "iCloud Drive" and make sure that it is turned on. Step 2: Look through the list of apps in the iCloud Drive and make sure that WhatsApp option is turned on. Step 1: Connect your iPhone to your computer and run iTunes on your computer . Step 3: Click "Back Up Now", then wait for the process to be finished. The WhatsApp voice messages will be saved in this iTunes backup file. You can also save the Voice messages in your WhatsApp account by forwarding them via email. Follow these simple steps to do it. Step 1: Find the Voice messages in the WhatsApp chat and then tap on it. Step 2: Click "Forward" when the option appears, and then click on the Forward icon in the lower-right corner. Step 3: Choose “Mail” and then enter your own email address to send it to yourself. You can then download the voice messages from the email attachment. 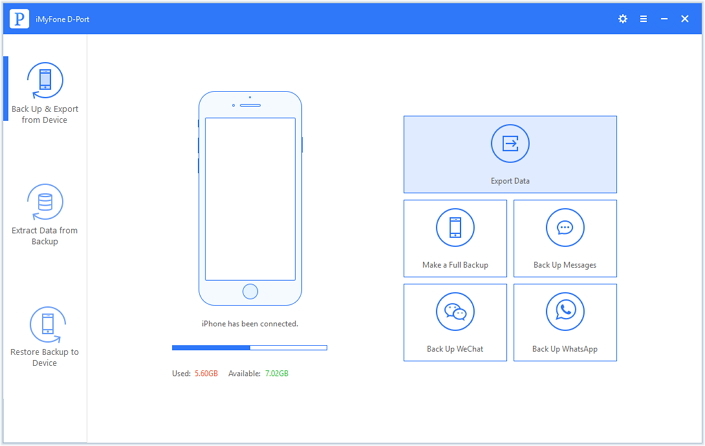 It allows you to see all your WhatsApp messages and the attachments currently on your iPhone or your iCloud/iTunes backup files without restoring a backup to your iPhone. 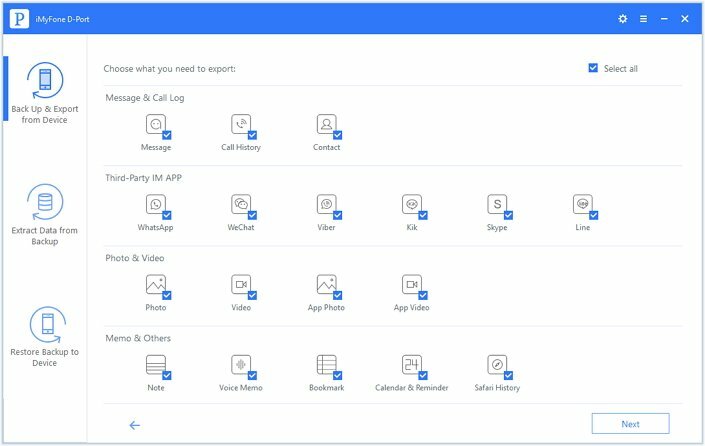 You can also use it to extract or save up to 18 different types of data including photos, contacts, videos, notes, call history, text messages, Viber messages and more to your computer. It is compatible with almost all iOS devices and all versions of the iOS operating system, including the latest iOS 12/11. It comes with a preview feature that allows you to selectively save existing data. 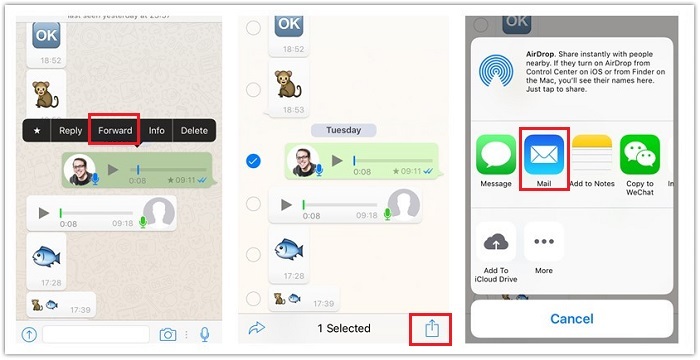 Here’s how to use it to save WhatsApp voice messages on your iPhone. Step 1: Download and install the program on your computer and then launch it. 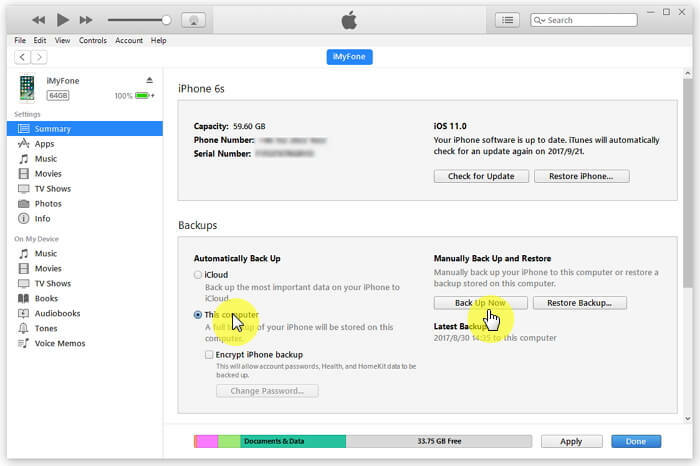 Connect the iPhone to the computer, select "Back Up & Export from Device" and then click on "Export Data" to begin. Step 2: In the next window select "WhatsApp" under Third-party IM APP and then click "Next" to scan your iPhone. Step 3: Once the scan is completed (it shouldn't take long), find the WhatsApp voice messages on the preview screen. Select the ones you want to save and then click "Export" to save them to your computer. 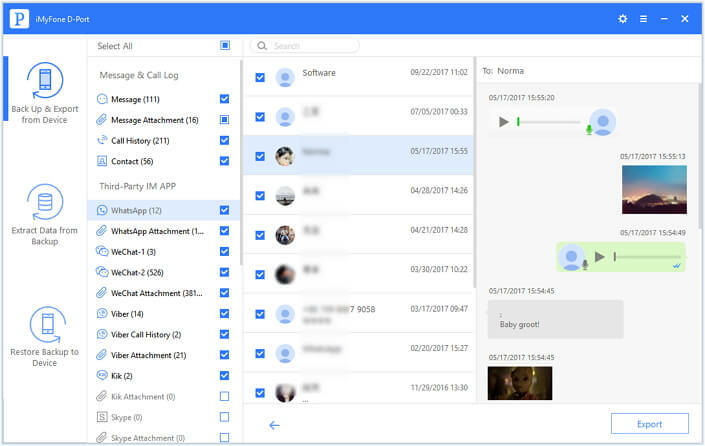 iMyFone D-Port makes it very simple to selectively save WhatsApp voice message and many other kinds of data from iPhone (iOS 12/11 is suported) onto your computer without restoring an entire iCloud/iTunes backup file. Now download iMyFone D-Port to save the WhatsApp voice messages or others from your iPhone!